Recently renovated with pergo flooring! Incredible location, without the price! Located on Main Street, Falmouth, close to local shops and restaurants, and within walking distance of Surf Drive Beach! You can make an online reservation at Town and Beach Motel or call 508-548-1380*. 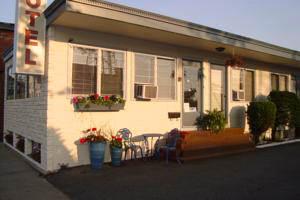 The Town and Beach is a small family run motel — our rooms are individually and tastefully decorated, the air of a Bed & Breakfast without the price. A high standard of personal service is maintained to ensure that the atmosphere is cheerful & friendly. Our staff are always on hand to assist you and make sure that you have a pleasant and enjoyable stay. Tired of driving? Check-in, leave your car in our parking lot and stroll down beautiful Main Street, Falmouth. Browse & shop in dozens of fine stores and boutiques, sit on a bench under the trees & relax, or dine at one of the many restaurants & sidewalk cafes. To get to the beach, it’s a short drive or walk (1/2 of a mile) down the lovely Shore Street, which is lined with oaks, elms and beautiful old homes. There you will find Surf Drive Beach. Nearby is the Shining Sea Bikeway, where you can walk, bike or roller blade to Woods Hole. All reservations booked after Jan. 1st, 2019 for stays occurring after July 1st, 2019 will be charged the new mandatory County tax of 2.75%, in addition to other applicable taxes & fees.